When it comes to the world of natural hair care, misinformation can be misleading. There are hundreds of hair products out there in the market. And while many of them have top-quality ingredients, not all of them necessarily leave your hair feeling cleaner or softer than before you stepped into the shower. Need chemical-free, no-fuss, amazing hair every day? The list below describes five of some of the best all natural hair products which consist of shampoos, conditioners, masks, balms, sprays, and treatments to keep your hair healthy, shiny, and soft. These products are the best all natural hair products that we could find, which reduces the chance of harming the environment or animals. Whether you have curls, straight tresses, or wavy locks, each of the hair products listed will care for your hair with healthy goodness! Blossom Ginseng Biotin Volumizing Conditioner builds and thickens your hair by protecting each strand’s follicle. Its special ingredient is maltodextrin, which covers each hair separately and also protects the health of the scalp while boosting the growth of new hair with the help of ginger and ginseng. Blossom Ginseng Biotin Volumizing Conditioner does not contain any parabens, sulfates, silicones, DEA, synthetic colors, or phthalates to irritate the skin, hair, or scalp. This all natural hair conditioner is vegan and cruelty-free! What’s more is that it can be used on chemically treated, relaxed, and colored hair. If you have problems with an itchy scalp, dandruff, or you just want to rejuvenate your hair, try this Green Olive and Lavender Scalp Oil. It will relieve the itchiness and help to stimulate natural and healthy hair growth. This oil absorbs excess gunk and build-up. Also, it keeps the moisture in while calming the skin. 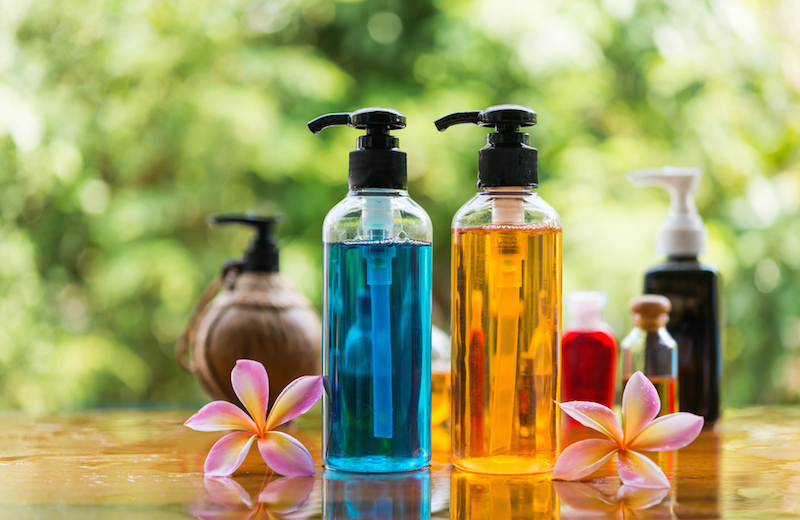 There are no parabens, sulfates, phthalates, artificial oils, or fragrance. The natural ingredients of olive oil, lavender, sweet almond oil, and vitamin E aids in promoting a healthy scalp. To use the oil for straight and wavy hair, apply to the fingers and massage into the scalp for ten to 15 minutes. Organix Coconut Milk Shampoo uses organic coconut milk, Vitamin E, and coconut extract to help replenish the hair and gives it a soft feel with a coconut tropical scent. The formula strengthens each hair strand with egg-white extract, and moisturizes and cleanses hair with its foamy lather. It does not contain any parabens or sulfates. For best results, you can use it with Organix conditioner and anti-breakage serum. Want beach hair without actually going for a swim? Mermaid Sea Salt Hair Spray gives you the sun-kissed waves you want with extracts of organic sea kelp and organic aloe vera for vitamins and moisture. You can use it to style the hair without drying it out. The special ingredient is Atlantic Sea Salt distilled from the ocean to add fresh volume to the hair. The rose scent is derived from rose geranium and palmarosa essential oils. Simply spray on and style as desired. Meadowfarm oil, mango nut butter, castor bean oil, and pomegranate oil are combined in this unique natural balm to nourish and style the hair. It sounds so good, you could almost eat it! The oils and butter are full of antioxidants while softening and moisturizing the hair for added shine. Suitable for all hair types, this balm also helps protect hair against color loss. It also contains rosemary, sunflower seed, vanilla, ylang ylang, and balsam extracts to add to the bouquet of natural scents. It is vegan, gluten, and cruelty-free, and it does not contain parabens, sulfates, phthalates, silicones, or any artificial scents or colors. Apply to semi-wet or dry hair as desired. Always remember when looking for the best all natural hair products, look for the ones that are environmentally safe, hypoallergenic, and cruelty-free.